It is almost Easter and in that spirit I did a bit of sewing last week. I made a teeny tiny dress. A friend at work had a baby last week, a little girl. This gave me a great excuse to sew something tiny and cute. The pattern is a free pattern literally called the Itty Bitty Baby Dress from Rae Hoekstra available for download from her site. It is really small and I even sized it up a bit. It is designed to fit a 3 month old as sewn. My children are all grown. One forgets how small new babies are! I love the little birds. 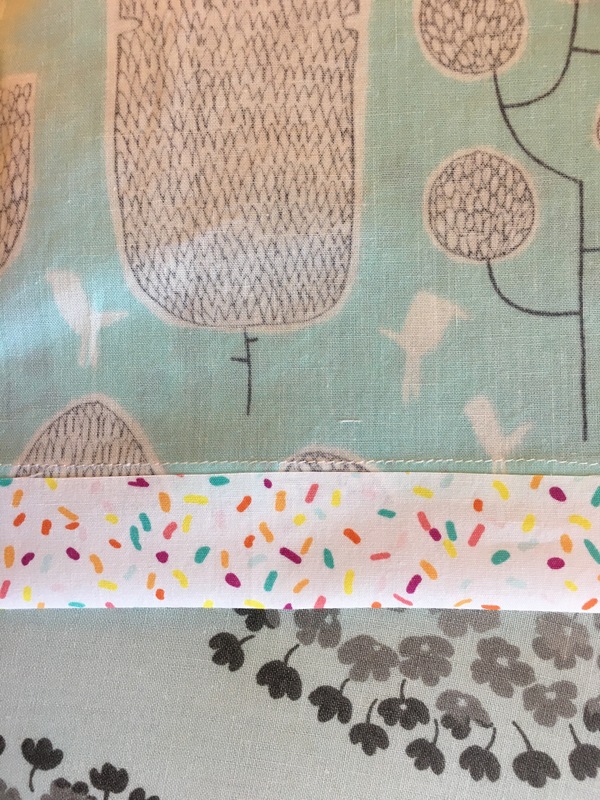 This fabric is cute but not cutesy which I love. My sewing wasn’t perfect but it really didn’t matter in the end. I made this little dress from fabric left over from a Ruby dress that I made and love. 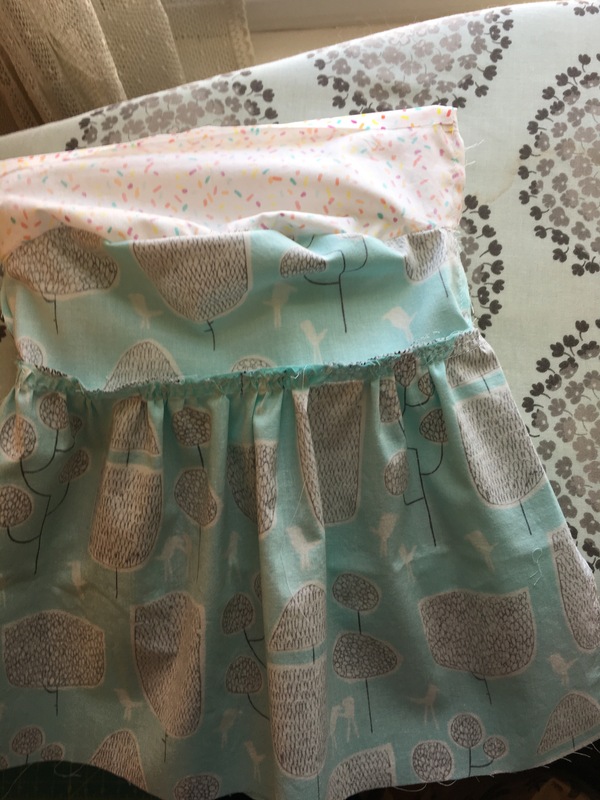 The fabric is Tokyo Trees from Cloud 9 fabrics. 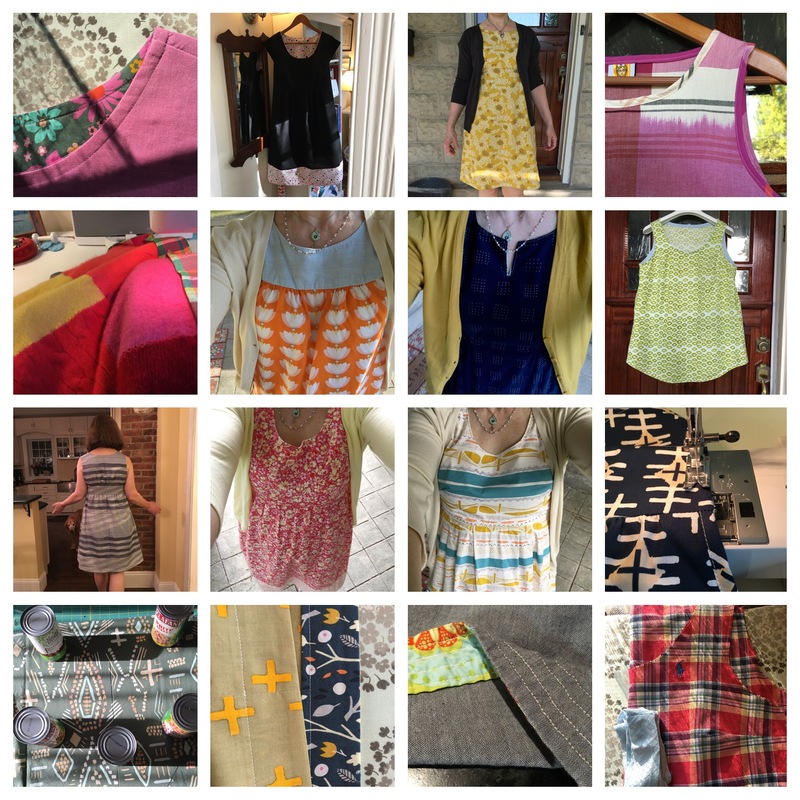 I bought it online at HoneyBeGood which has a great selection of organic fabrics. The lining fabric was a fat quarter I had purchased from The Cloth Pocket. It is still available at various stores. 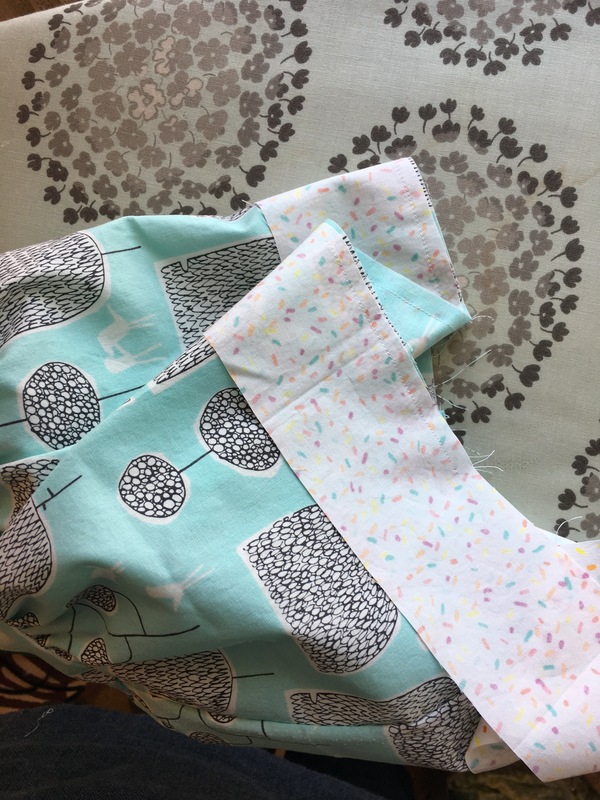 The fabric is from a collection called Boardwalk Delight by Art Gallery Fabrics. I couldn’t resist the sprinkles. (below before I hand sewed the bodice lining) I love the rabbit ear shape the ties make. The curves are very small by the way which is a bit of a challenge-sew slowly 🙂 In preparation for grandparenting which I hope to not be too far off-maybe 2 or 3 years?- I had already purchased the Geranium and Flashback Tee patterns when Rae had a pattern sale earlier this year. 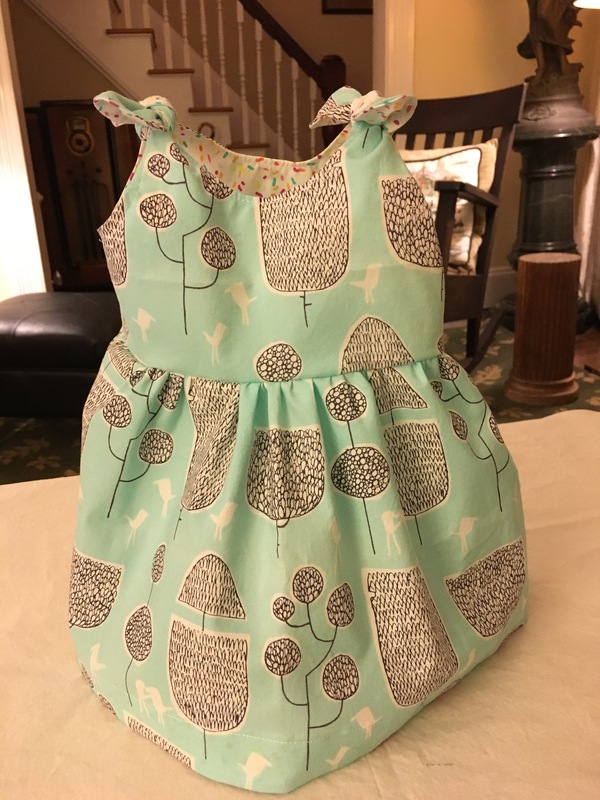 I love the many variations of those patterns (especially this one which reminds me of outfits my girls wore when they were little) and look forward to sewing them in the future. But this little pattern has no buttons or zippers so I thought I would try it as I was sewing last minute the day before the shower-as I do. It didn’t disappoint. I simplified it a bit, eliminating the piping in the interest of time and I created a hem facing the same way I always do, only smaller. It is pretty foolproof and quick. One challenge was not having a small enough hanger to properly show off the finished product. I tried to improvise. I am not sure I am doing it justice in this photo. I sewed everything by machine except for the last seam where I hand sewed the bodice lining. You could probably do that by machine as well but I don’t trust myself with the tiny gathers. It doesn’t take long. 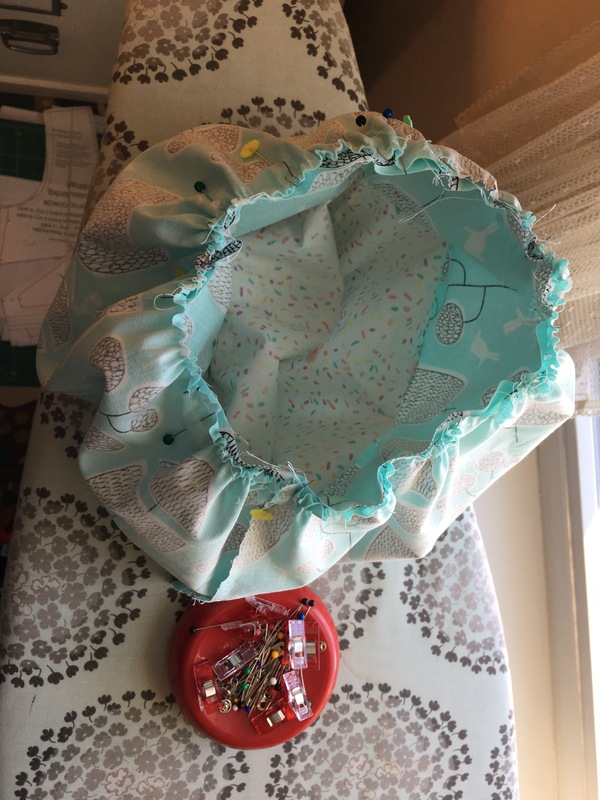 I enjoy hand sewing and it is quicker to hand sew once than to machine sew and have to redo it. Some more construction pictures below. Hem facing. Attaching bodice. Such quick little seams to sew. One lesson learned, it you want to topstitch around the neck and armholes, wait until after you attach the front and back bodice pieces together. Ask me how I know that? I got a little ahead of myself. But it all worked out in the end. Love it. Lucky baby, lucky mommy. Aww so cute! I love sewing tiny clothes. I’m sure mom and baby will love it too!